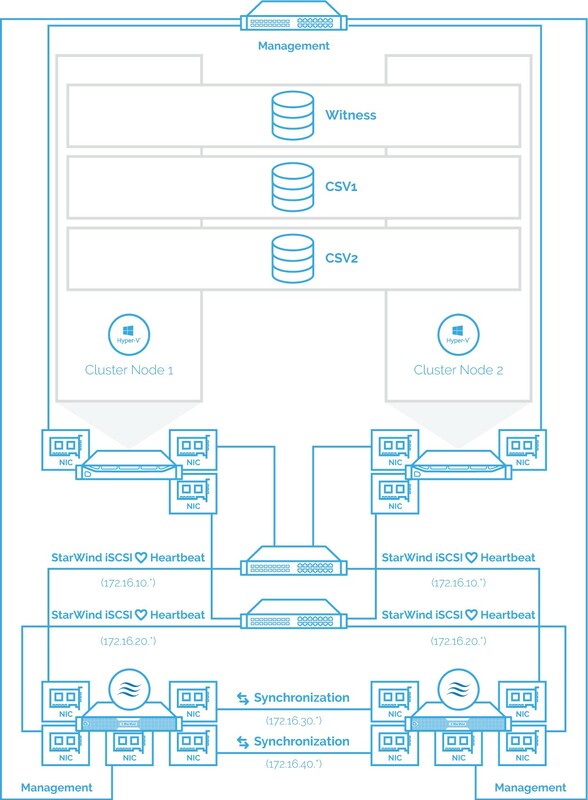 StarWind Virtual SAN supports both architectures: hyper-converged and compute- and storage-separated. Running compute and storage layers separately make it possible to scale compute and storage resources independently. This technical paper provides a detailed step-by-step guidance on configuring a 2-node Hyper-V Failover Сluster using StarWind Virtual SAN to turn storage resources of the separated servers into a fault-tolerant and fully redundant shared storage for Hyper-V environments. 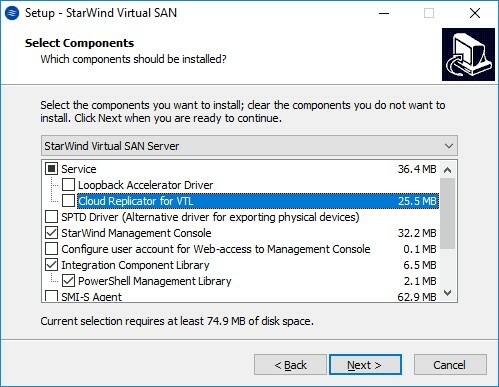 This guide is intended for experienced Windows system administrators and IT professionals who would like to configure the Hyper-V cluster using StarWind Virtual SAN to convert the clustered storage space into the fault-tolerant shared storage resource. 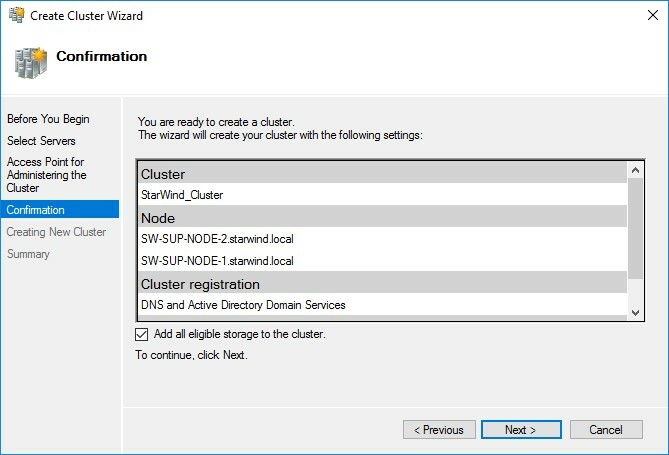 It also highlights how to connect the StarWind HA devices to the Microsoft iSCSI initiator and configure the StarWind shared storage as the Cluster Shared Volumes. The diagram below depicts the network architecture of the configuration described in this guide. NOTE: Additional network connections may be required depending on the cluster setup and applications that are running. In this document, 172.16.10.x and 172.16.20.x subnets are used for iSCSI/StarWind Heartbeat traffic while 172.16.30.x and 172.16.40.x subnets are used for the Synchronization traffic. 4. 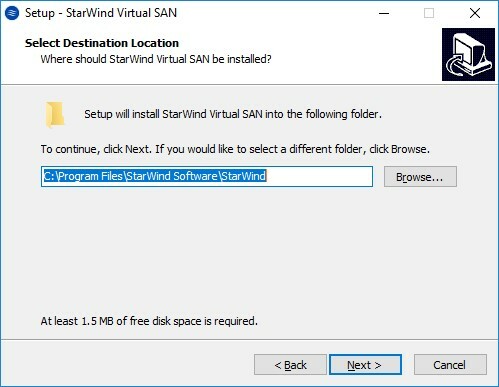 In order to allow iSCSI Initiator to discover all StarWind Virtual SAN interfaces, StarWind configuration file (StarWind.cfg) should be changed after stopping StarWind service. Find the string < iScsiDiscoveryListInterfaces value=”0” />; and change the value from 0 to 1 (should look as follows: < iScsiDiscoveryListInterfaces value=”1” />;). Save the changes and exit Wordpad. 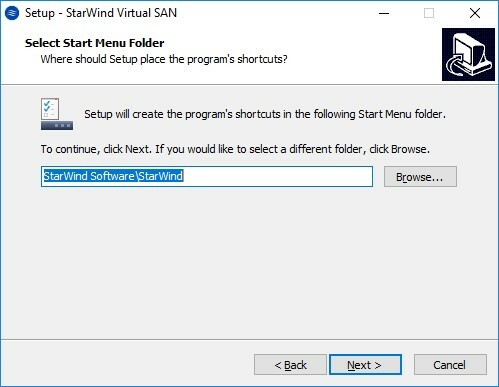 Once StarWind.cfg has been changed and saved, StarWind service can be started. Please note, this tip can be used only for Windows-based compute nodes. 1. On the compute nodes, open the MPIO manager: Start->Administrative Tools>MPIO. 2. Go to the Discover Multi-Paths tab. 3. 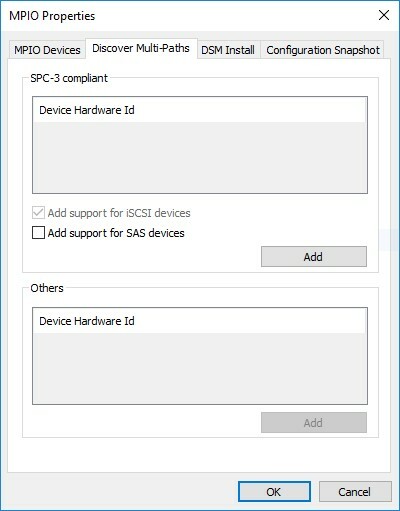 Tick the Add support for iSCSI devices checkbox and click Add. 4. When it is prompted to restart the server, click Yes to proceed. 6. 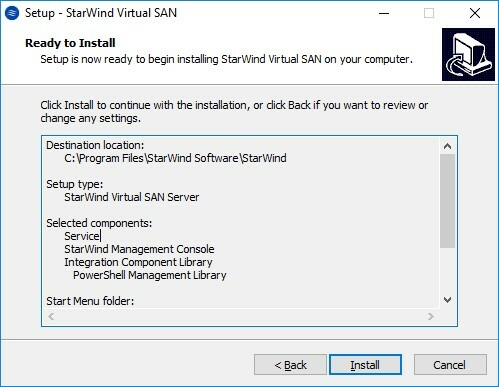 Launch the downloaded setup file on the server where StarWind Virtual SAN or one of its components need to be installed. The setup wizard appears. 7. Read and accept the License Agreement. 8. Read the information about new features and improvements carefully. Red text indicates warnings for users who are updating existing software installations. 9. Click Browse to modify the installation path if necessary. 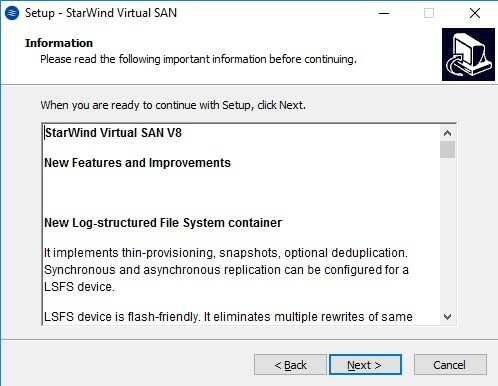 StarWind Virtual SAN service. 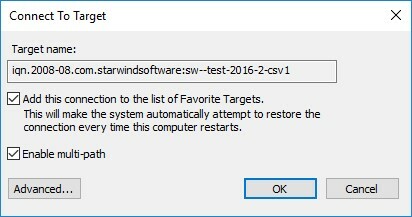 StarWind service is the “core” of the software. It can create iSCSI targets as well as share virtual and physical devices. 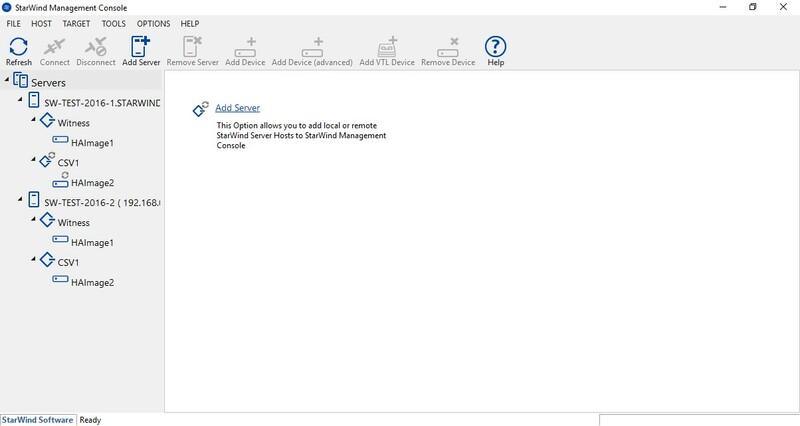 The service can be managed from StarWind Management Console on any Windows computer or VSA connected to the network. Alternatively, the service can be managed from StarWind Web Console and deployed separately. StarWind Management Console. 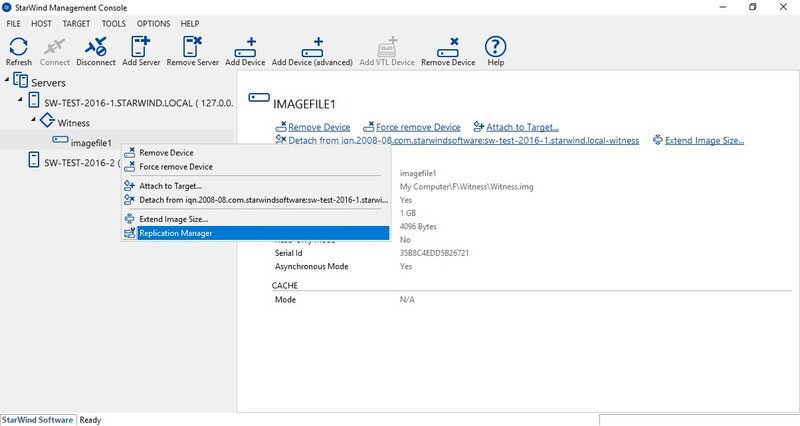 The Management Console is the Graphic User Interface (GUI) part of the software that controls and monitors all storage-related operations (e.g., allows users to create targets and devices on StarWind Virtual SAN servers connected to the network). 11. Specify the Start Menu folder. 12. Enable the checkbox to create a desktop icon. 13. 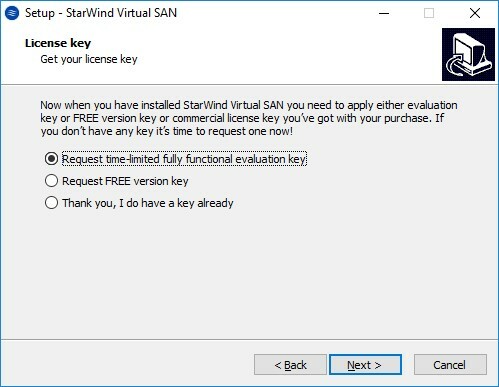 There is an option to request a time-limited fully functional evaluation key, or a FREE version key, or a fully commercial license key sent to you with the purchase of StarWind Virtual SAN. Select the appropriate one. 14. Click Browse to locate the license file. 15. Review the licensing information. Click Next to apply the license key. 16. Verify the installation settings. Click Back to make any changes or Install to continue. 17. 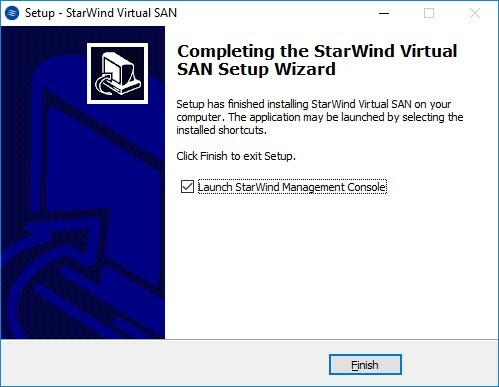 Select the appropriate checkbox to launch the StarWind Management Console right after the setup wizard is closed. 18. 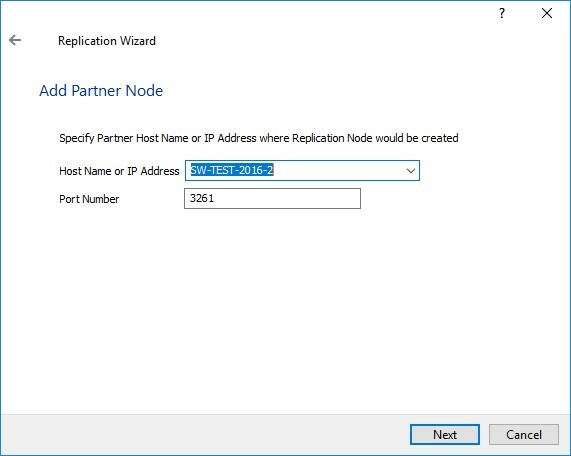 Repeat the installation steps on the partner node. 19. 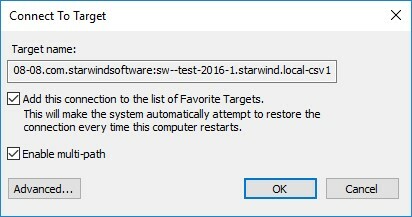 Launch StarWind Management Console by double-clicking the StarWind tray icon. StarWind service using the default credentials. To add remote StarWind servers to the Console, use the Add Server button on the control panel. 20. 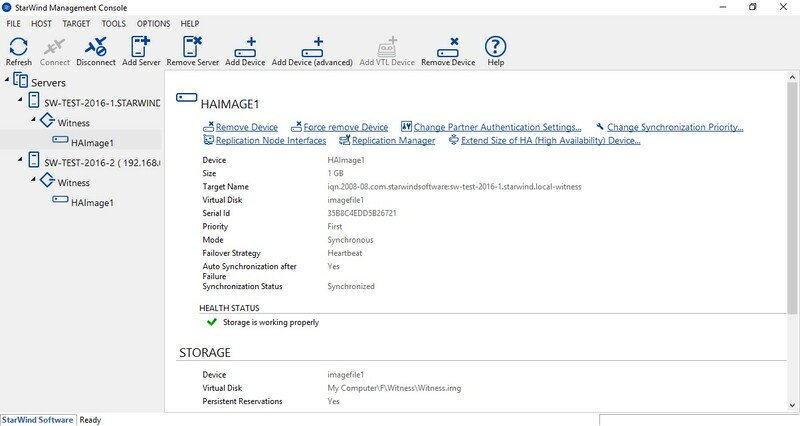 StarWind Management Console will ask to specify a default storage pool on the server you connect to for the first time. Please, configure the storage pool to use one of the volumes you have prepared earlier. All the devices created through the Add Device wizard are stored in the configured storage pool. 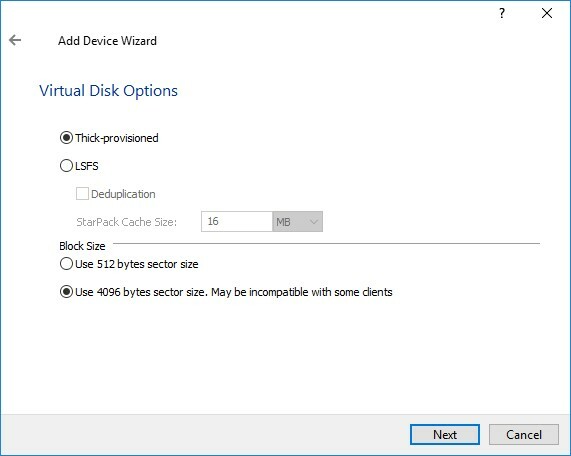 Should you decide to use an alternative storage path for your StarWind virtual disks, please use the Add Device (advanced) menu item. 21. 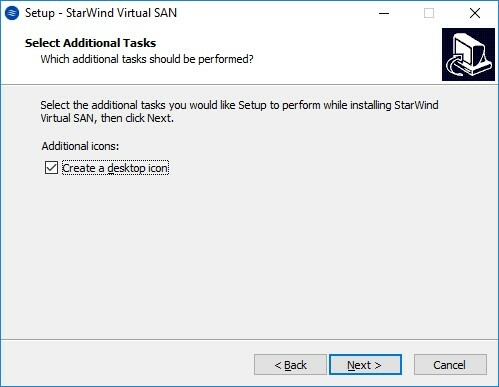 Select the StarWind server where the device intends to be created. 22. Press the Add Device (advanced) button on the toolbar. 23. Select Hard Disk Device in Add Device Wizard and click Next. 24. Select a Virtual disk and click Next. 25. 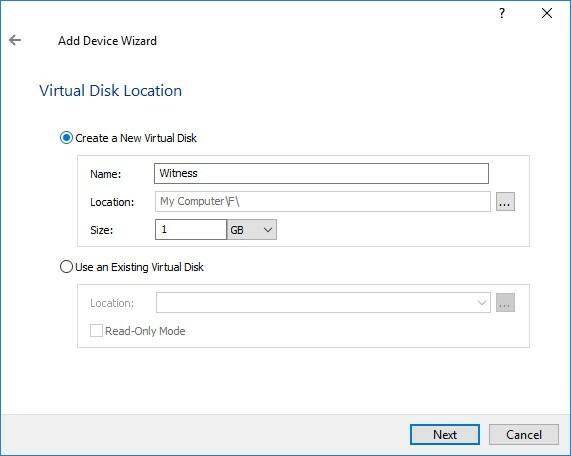 Specify the virtual disk name, location, size and click Next. Below, you can find how to prepare an HA device for a Witness drive. Devices for Cluster Shared Volumes (CSV) should be created the same way. 26. Specify virtual disk options. 27. 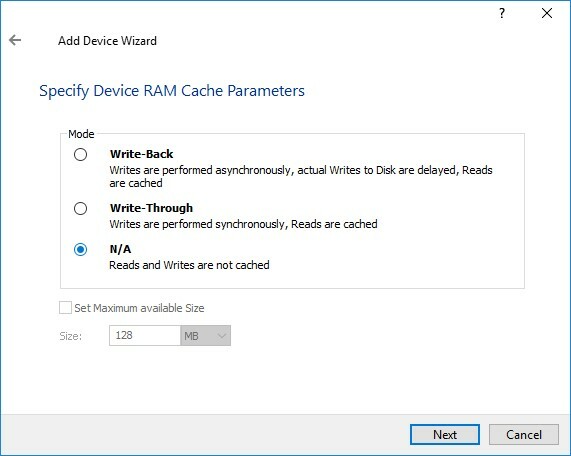 Define the caching policy, specify the cache size, and click Next. 28. 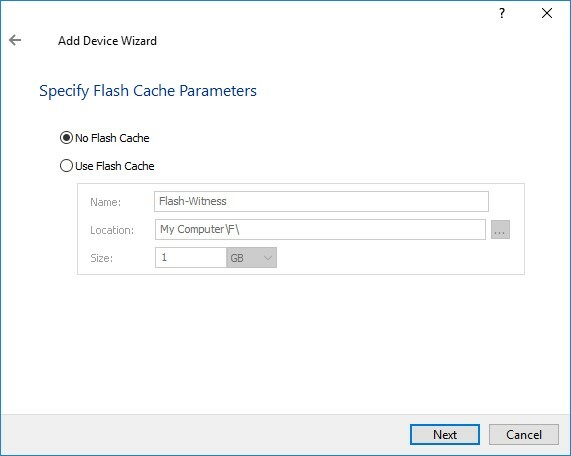 Define optional Flash Cache Parameters policy and size if necessary. Choose an SSD location in the wizard. Click Next to continue. Target Name is generated automatically based on the target alias. Additionally, custom name of the target can be assigned. Click Next to continue. 30. Click Create to add a new device and attach it to the target. Then, click Close. 31. Right-click the servers field and select Add Server. 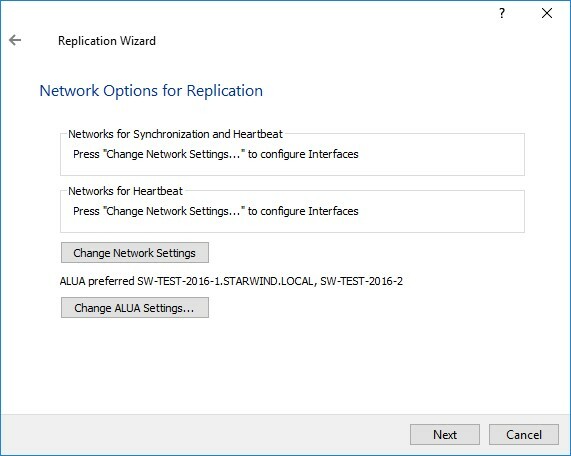 Add a new StarWind server which will be used as the second HA node. Click OK and the Connect button to continue. 32. 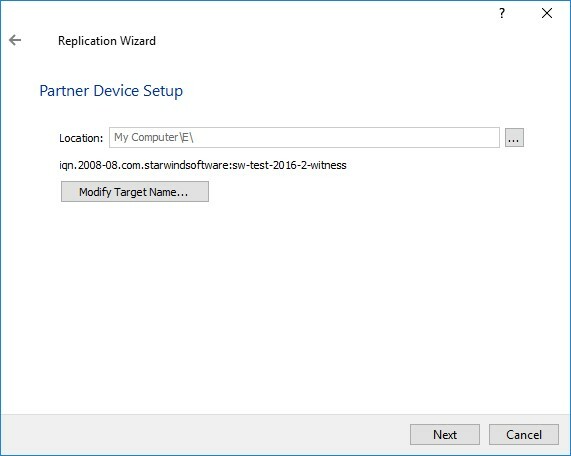 Right-click the recently created device and select Replication Manager. 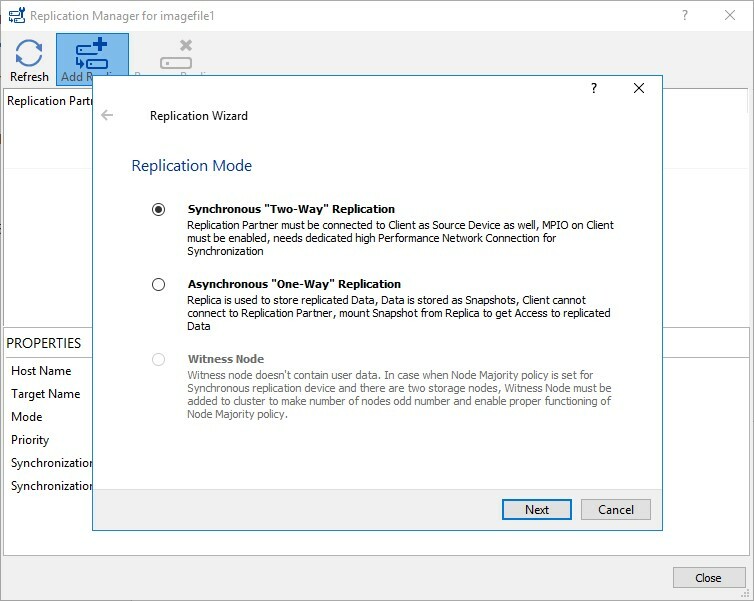 Press the Add Replica button in the Replication Manager window. 33. Select Synchronous two-way replication and click Next to proceed. 34. Specify the partner server IP address. 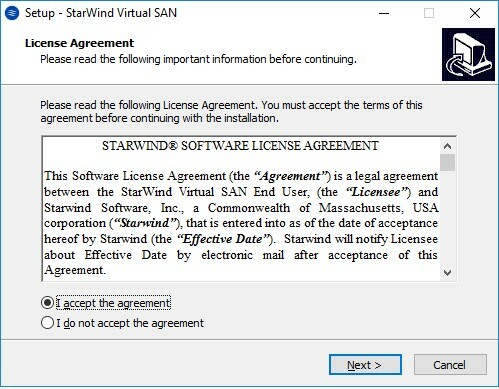 The default StarWind management port is 3261. If you have configured a different port, please type it in the Port number field. Click Next. 35. 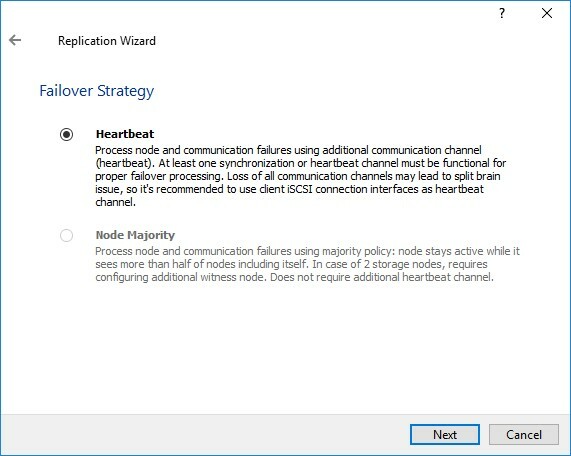 Select Heartbeat as the Failover Strategy and click Next. 36. Choose Create new Partner Device and click Next. 37. 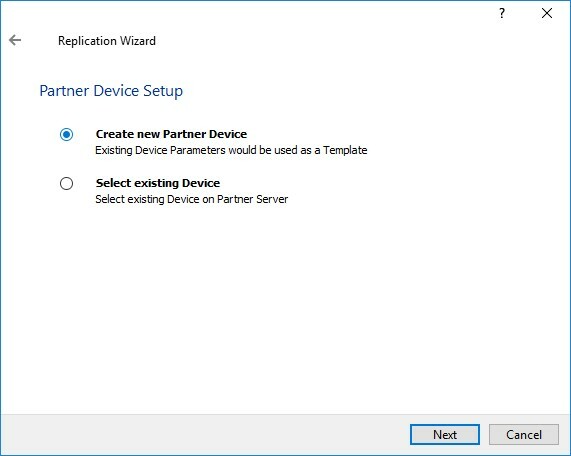 Specify the partner device location if necessary. You can additionally modify the target name of the device. 38. Specify the synchronization and heartbeat channels for the HA device on this screen. You can also modify the ALUA settings. 39. Specify the interfaces for synchronization and Heartbeat. NOTE: It is recommended to configure the Heartbeat and iSCSI channels on the same interfaces to avoid the split-brain issue. 40. 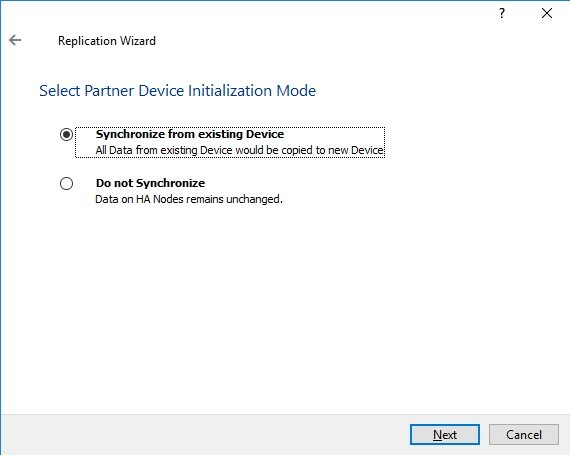 Select Synchronize from existing Device as a partner device initialization mode and click Next. 41. Press the Create Replica button and click Close. 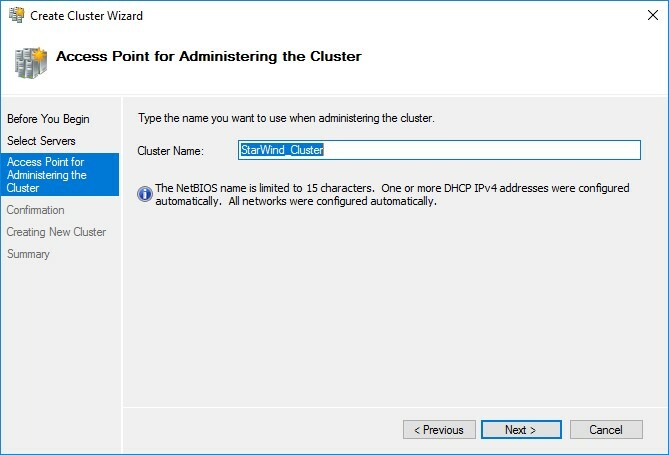 This part describes how to discover Target Portals from each StarWind node on each Cluster node. 44. Navigate to the Discovery tab. Click the Discover Portal button. 45. 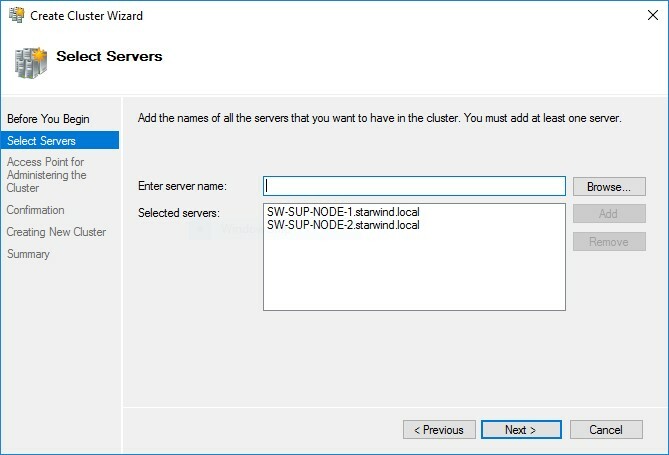 Select Microsoft iSCSI Initiator as Local adapter and select Cluster Node 1 initiator IP address from the same subnet. Click OK twice to add the Portal. 46. Click the Discover Portal button once again. 47. 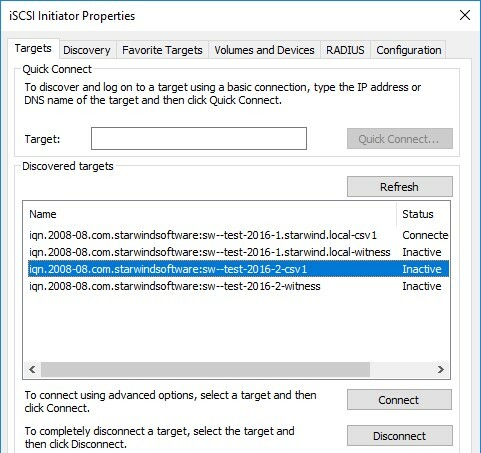 In Discover Target Portal dialog, enter the second iSCSI IP address of the first StarWind Node and click the Advanced button. 48. Select Microsoft iSCSI Initiator as Local adapter and select Cluster Node 1 initiator IP address from the same subnet. Click OK twice to add the Portal. 49. 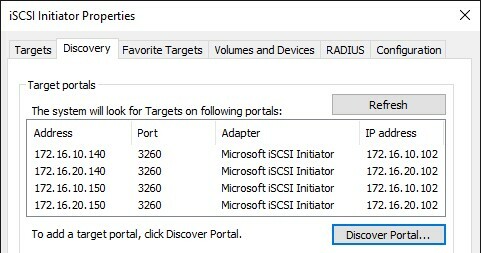 Target portals are added from the first StarWind Node. 50. 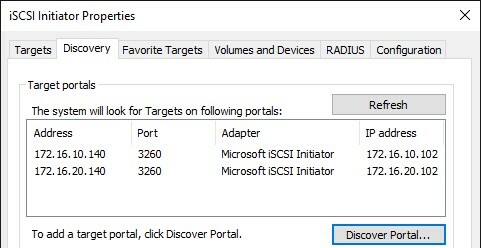 To Discover Target Portals from the second StarWind Node, click the Discover Portal button once more, enter iSCSI IP address for the second StarWind Node, and Click the Advanced button. 51. Select Microsoft iSCSI Initiator as Local adapter and select Cluster Node 1 initiator IP address from the same subnet. Click OK twice to add the Portal. 52. Choose the Discover Portal button once again. In Discover Target Portal dialog, enter the second iSCSI IP address of the second StarWind Node. Click the Advanced button. 53. Select Microsoft iSCSI Initiator as Local adapter and select Cluster Node 1 initiator IP address from the same subnet. Click OK twice to add the Portal. 54. All target portals are successfully added to the Cluster Node 1. 55. Perform the steps of this part on the Cluster Node 2. All target portals added to the Cluster Node 2 should look like in the picture below. 56. 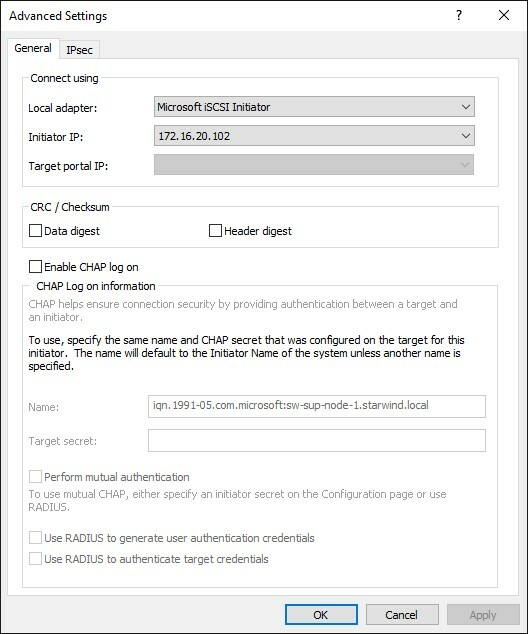 Launch Microsoft iSCSI Initiator on Cluster Node 1 and click on the Targets tab. The previously created targets should be listed in the Discovered Targets section. 57. 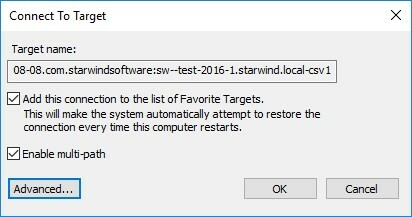 Select a target discovered from the first StarWind Node and click Connect. 58. Enable checkboxes like in the image below and click Advanced. 59. 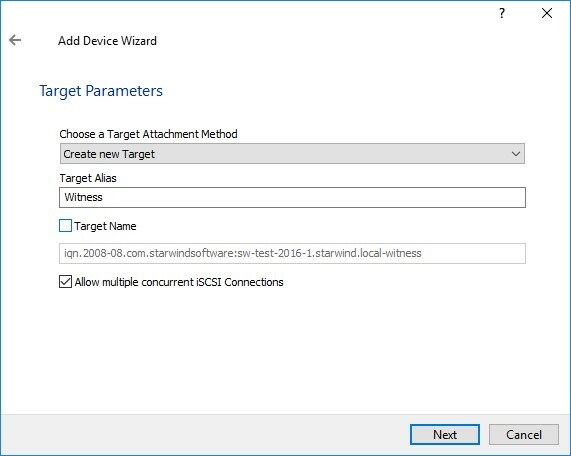 Select Microsoft iSCSI Initiator in the Local adapter text field. 60. 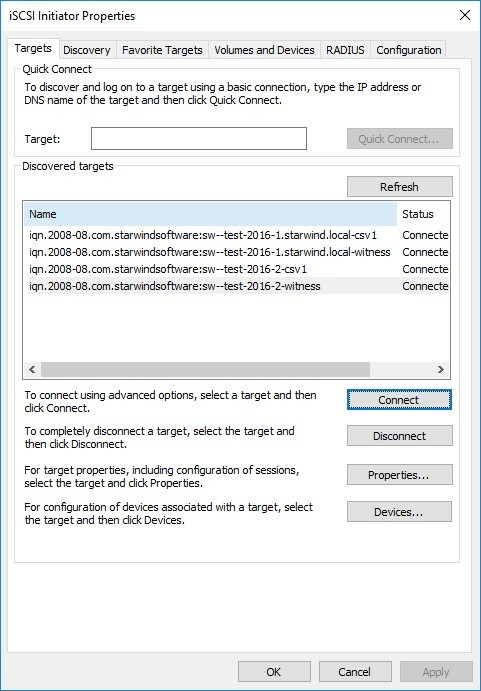 In the Target portal IP, select the IP address of the first StarWind Node and Initiator IP address from the same subnet. Click OK twice to connect the target. 61. To connect the same target via another subnet, select it one more time and click Connect. 64. 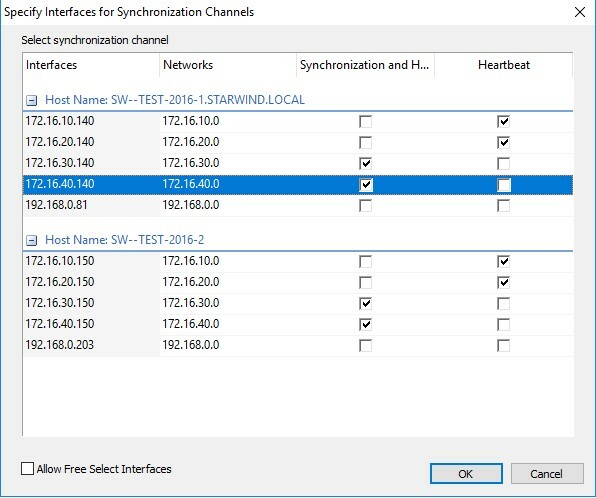 In the Target portal IP, select another IP address of the first StarWind Node and Initiator IP address from the same subnet. Click OK to connect the target. 65. 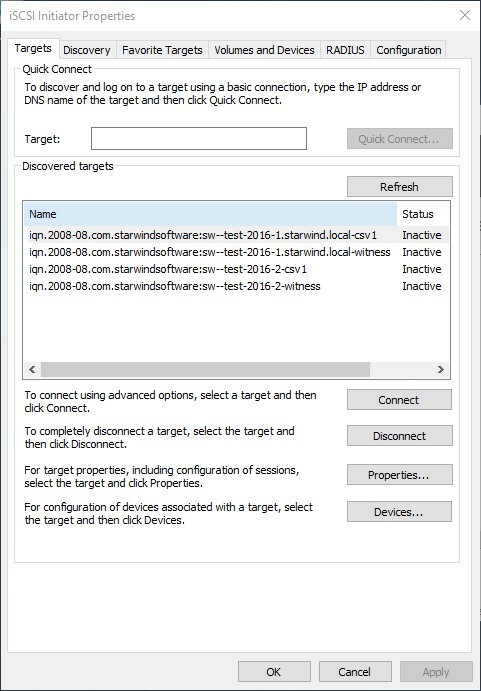 Select the partner target discovered from the second StarWind node and click Connect. 66. Enable checkboxes like it is shown in the image below and click Advanced. 68. 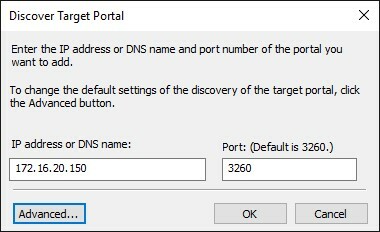 In Target portal IP, select the IP address of the second StarWind Node and Initiator IP address from the same subnet. Click OK twice to connect the target. 69. To connect the same target via another subnet, select it one more time and click Connect. 70. Enable checkboxes like in the image below and click Advanced. 71. 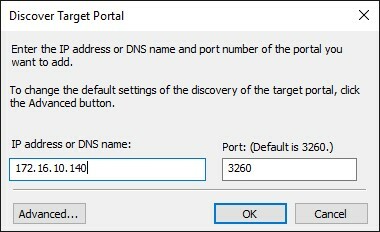 In the Target portal IP, select another IP address of the second StarWind Node and Initiator IP address from the same subnet. Click OK to connect the target. 72. Repeat the above actions for all HA device targets. 73. Initialize the disks and create partitions using the Disk Management snap-in. To create the cluster, the disk devices must be initialized and formatted on both nodes. NOTE: it is recommended to initialize the drives as GPT. 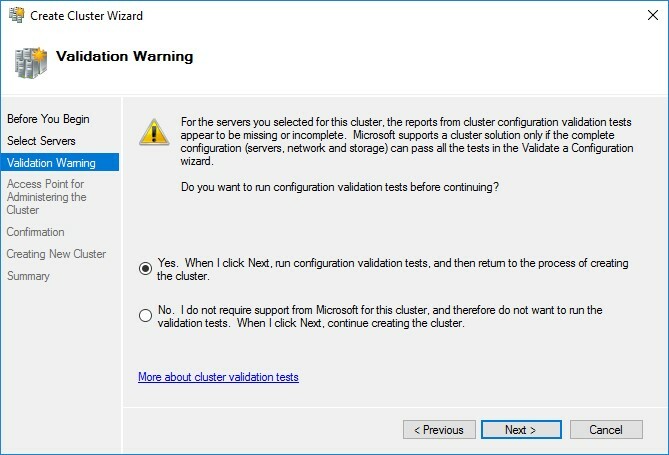 NOTE: To avoid issues during cluster configuration validation, it is recommended to install the latest Microsoft updates on each node. 74. Open Server Manager. Select the Failover Cluster Manager item from the Tools menu. 75. 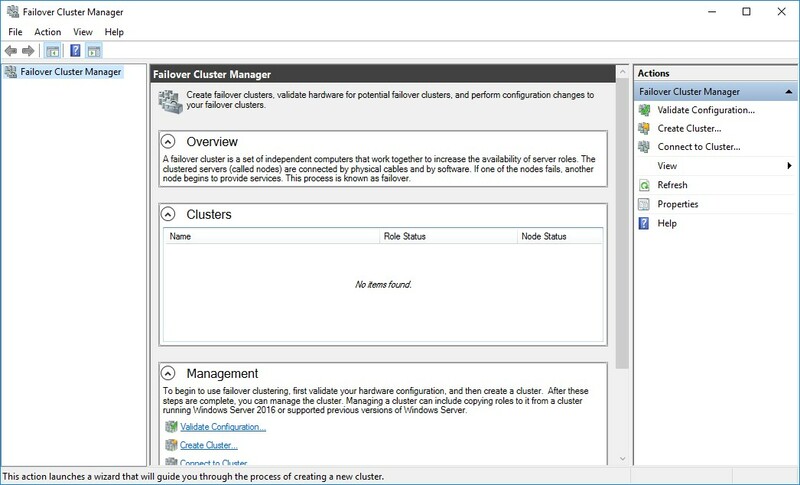 Click the Create Cluster item in the Actions section of the Failover Cluster Manager. Specify the servers that need to be added to the cluster. Click Next to continue. 76. Verify that your servers are suitable for building a cluster. Select “Yes…” and click Next. 77. Specify the cluster name. NOTE: If the cluster servers get IP addresses over DHCP, the cluster also gets its IP address over DHCP. If the IP addresses are set statically, you need to set the cluster IP address manually. 78. Make sure that all of the settings are correct. Click Previous to make any changes. Click Next to continue. 79. The cluster creation process starts. Upon completion, the system displays the report with detailed information. 80. Open Failover Cluster Manager. 81. Go to Cluster->Storage -> Disks. 82. Click Add Disk in the Actions panel, choose the disks from the list and click OK.
83. 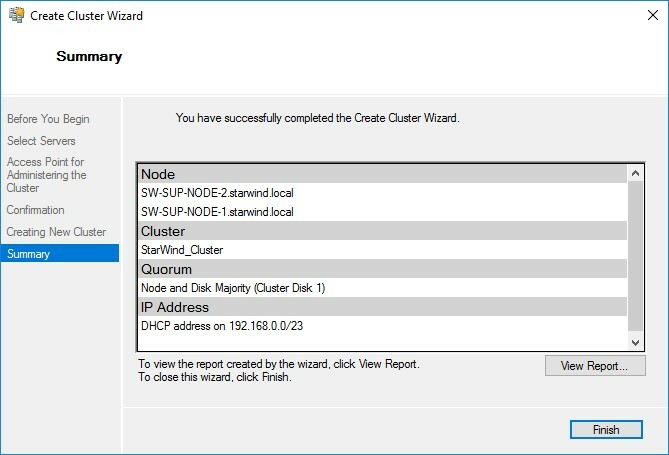 To configure a Witness drive, right-click the Cluster->More Actions->Configure Cluster Quorum Settings, follow the wizard, and use the default quorum configuration. 84. Right-click the required disk and select Add to Cluster Shared Volumes. Once the disks are added to the Cluster Shared Volumes list, you can start creating the highly available virtual machines on them. NOTE: To avoid the unnecessary CSV overhead, configure each CSV to be owned by one Cluster node. This node should also be the preferred owner of the VMs it runs. The cluster increases availability of the services or applications on it. 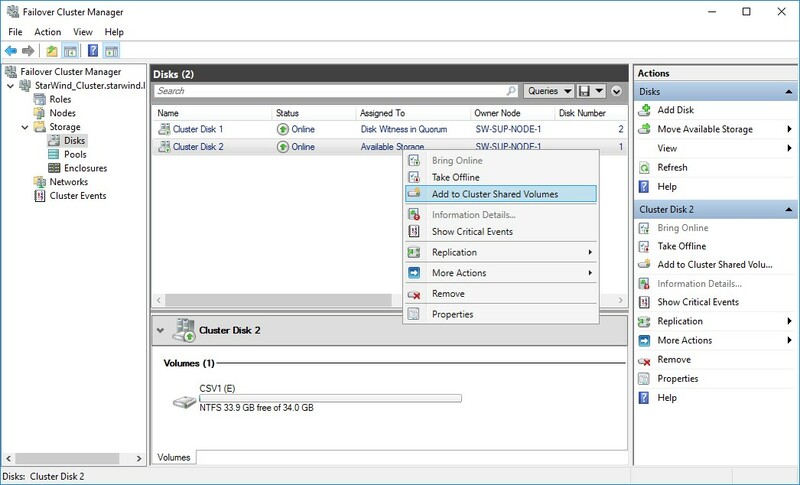 CSV feature simplifies the storage management by allowing multiple VMs to be accessed from a common shared disk. Resilience is provided by creating multiple connections between StarWind nodes and the shared disk. Thus, if one of the nodes goes down, another one will take over the production operations.